This time, things didn't come together. We wanted to see the show at the world's largest water fountain. We had read that the Sunset Fountain of Dreams musical water fountain was really something to see, so after the morning rain cleared up a bit, we headed out on an excursion to Dadaepo Beach where the fountain is located. We took the subway line #1 right to the end of the line, and then we were supposed to transfer to a bus, but I had checked the map and thought that it was only about 2.5 kms to walk, and it wasn't raining so off we went. Now, we think that it was about 5 kms (3 miles). Oh well...at least we got some exercise. But it wasn't very scenic. Most of the walk was through an industrial area with a lot of manufacturing. We saw leather manufacturing, chains and shackles, auto parts...really industrial and a wide variety of businesses. Sometimes we could hear all kinds of machinery operating behind the walls and we could only wonder what they were making. But at least we were on a decent cycle/pedestrian path. We sure did look out of place though. Taxis kept on honking thinking we must be lost! I had read that the fountain operates at 2pm, 3pm, and 4pm...and the lighted show at 7:30pm. We were going to be too late for the 3pm show, but no problem for the 4pm. We got to Dadaepo Beach and there's a whole lot of construction activity. Apparently they're extending the subway line out here. We walked down to where the the fountain show would take place. And pretty quickly, we figured out that it wasn't going to take place! At least not while we were there. We made our way to a little info booth and the girl didn't speak any English, but she did find a way to tell us that the show wasn't until 7:30pm. The website had said... From March to November, the fountain show is four times during day, and once in the evening (twice on Saturday, Sunday and national holidays). No shows on Mondays. It also said... Subject to change. So I guess they changed things. The center fountain shoots 180 feet high! We're a little disappointed that we went all the way out there for pretty much nothing. Anyhow, such is life. We did go for a cloudy walk on the beach though, and there's a nice park there and a trail along the coast for a few hundred yards. The new park at Dadaepo Beach. Ruth, looking back at the beach. Kevin, and the shoreline. This part is actually a bird sanctuary. Above this area is the direct incoming flight path of the Busan airport. So for about two hours we had seen a constant line of airplanes coming into this city of 3.5 million people. Some of them were pretty interesting! Some kind of military plane. And another. This one was really loud! We couldn't hang around for the 7:30pm show because we had to buy a new power supply for Ruth's laptop. And our couchsurfing host Kim had sent us the directions to get to a place where they might have one and he had said that they close at 6:00pm. The power supply for Ruth's laptop had originally gone bad last year when we were in Namibia, and we had bought one there. It had been a very cheap "Made in China" one that you could tell was really cheap just by looking at it! But, we got a year out of it before it fell apart a couple of days ago. Using our borrowed iPhone (thanks June!) and our portable wifi source from WiFi-Korea we were able to get ourselves to this little tiny store in the downtown area. The picture makes this store look bigger than it is! The guy searched his own inventory, then put his finger up in the air as if he was saying "wait here", and off he went leaving us in charge of the store. He was back in five minutes with the proper power supply! Total cost, 30,000 won (about $33). We had paid about $25 for the garbage one we bought in Africa, and this one was obviously better quality. Ruth had brought her little laptop with her, and sure enough it worked perfectly. At least that part of our day came together! Tomorrow is another travel day. Can't believe we're almost 3/4 of the way through our time here already! That was a bummer, the fountain looked like it would have been an amazing sight to see. You made the best of the day, though. Can't believe you're almost ready to head out, it seems like you just arrived! Yep, I think that it would have been. Had we known that they didn't have any daytime shows we would have arranged our schedule to arrive there for the nighttime show. Oh well, guess that just means we will have to return some other time, which would be fine with us as there is still too much to see in Korea and we just don't have time for it all. Sorry about the lack of fountain viewing. Life IS SUBJECT TO CHANGE, isn't it.....every day! Yes, it was a bit of a let down but we made the best of it and enjoyed spending some time in the area and viewing the beach instead. Were they able to find a North American style plug, or will you be able to swap it out? I also find that happens with blogger myself, it usually just happens with my very first comment. I have now learned to copy it, just in case! No, the plug is the same as the plugs here and also the same as the one I had in South Africa that just gave out on me. I have an adapter that goes on the end of it to switch it over to the North American style plugs. Sorry your day didn't turn out as expected but you have been very lucky so far with most things! Actually we have had a few things here in Busan that haven't quite worked out the way we wanted. The first one was when we went to a huge shopping centre on Monday so that we could see the roof top garden which is suppose to be amazing and found that it was closed as well as the majority of the stores. On Tuesday the Skywalk was closed and then it started raining too hard for us to walk a trail that we wanted to do and then again when we went to view the UN Memorial Cemetery of Korea and it started raining too hard again. We still made the most of what we could though. We would definitely love to come back here again though as there is still so much to see. When you're going through a place like that, don't you ever just want to walk in, go up to the first worker and ask if you can follow him home to see how he lives and what his life is like? It would be cool. You never know who you'll meet. It's true you never know who you will meet. This coming weekend we will be able to see what life is like in a Korean home, when we go and visit June's parents in Gimcheon. 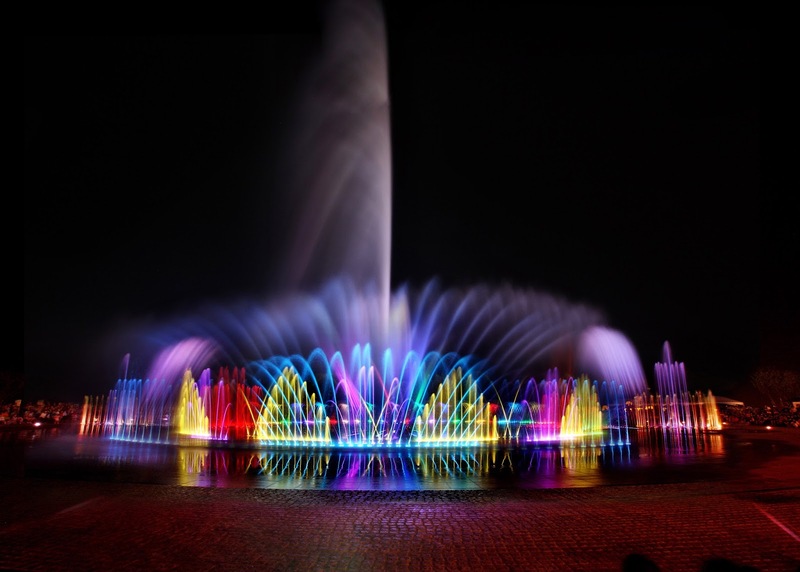 We hope that you will be able to see the fountain show in Lima as well. We will just love looking at your photos after that experience. It was a bit of a disappointment but maybe we will have time to see a water show in Seoul when we are back there at the beginning of the week. Some days go wonderful and some days go sideways, but yours ended up straightening out, all was not lost.Like you said at least you got some exercise and a new power supply. 2 out of 3 ain't bad. We always seem to make things work out and yesterday was no different. Definitely happy about being able to get a new power source for my computer though.